You are probably getting this error message because the Conduit file, BackgroundContainer.dll, has been removed from your computer, but your system is still configured to run the BackgroundContainer.dll file with the rundll32.exe tool. 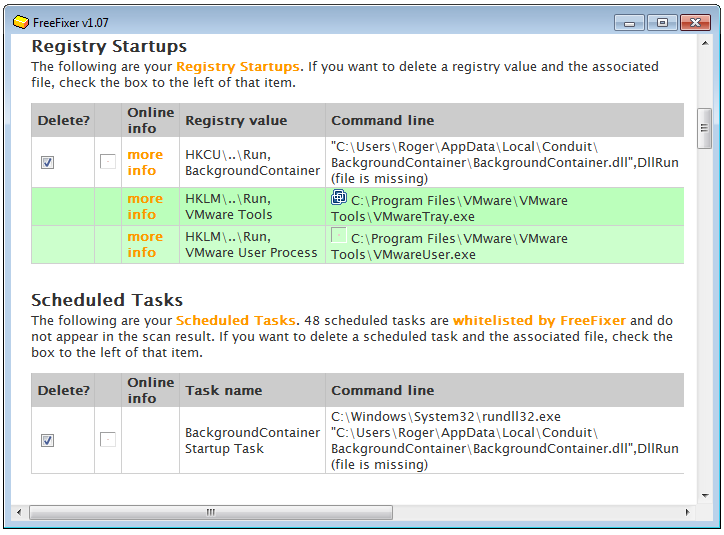 You can get rid of this error message by removing the start-up entry in the registry and in the Windows Task Scheduler. You can also fix the error message with the FreeFixer tool. I’ve captured a screenshow that shows the two items you need to check for removal in FreeFixer’s scan results. Removing those two items will stop the Run DLL error from popping up during startup. Did that help you remove the BackgroundContainer.dll RUNDLL error? By the way, how did you get this error message? Did your anti-virus program remove Conduit’s BackgroundContainer.dll file, or did you remove it manually and forgot the items in the registry and the Task Scheduler? I wanted to personally thank you for making FreeFixer available to the community. It resolved my Conduit issue. I most certainly will let others know about you and your site, as well as I will review your other products and look to purchase those ha are applicable. Again, you are doing a great service for others. Happy to hear FreeFixer helped you fix the Conduit RunDll error. Thanks for the feedback. Hope this fix it works for my Computer.Thank you ! Checked out your program because of that conduit rundll problem and am very happy that it was an easy fix. Looks like a very powerful program, so as suggested, I will use it cautiously! Thanks! Sandra, thanks for using FreeFixer. I am curious, I am struggling with this Conduit, Backgroundcontainer.dll thing and its been driving me nutso! I seem to have it fixed now, but, is this file and error message stuff simple or is it a browser takeover malware with other associated programs and oddities downloaded onto my computer which are still lurking in the shadows? for which this fix just gets rid of the error message but not the problem?